Have you joined the Flickr group yet? I've also set up a board on Pinterest. If you have a Pinterest account already and wish to add pictures to the board let me know by email and I will add you. If you'd like an invitation to Pinterest please email me. But be warned! It is almost more addictive than Facebook, although you can often rationlise the time spent on Pinterest rather more than Facebook!!! 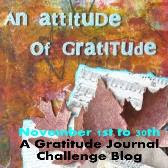 As I said last week, you can use the daily blog posts to just give you an idea and then to write down 3 - 5 things you are grateful for that day. 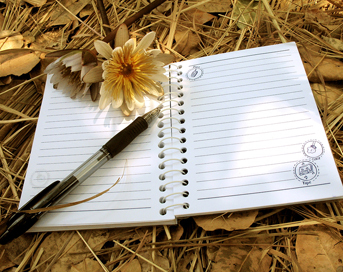 It can be an ordinary exercise book or a more special notebook. If you like papercrafting you could make scrapbook layouts for each day. If you do that I suggest you don't go bigger than 8x8" unless you've got lots of time. You could make a minibook if you prefer. Here are instructions for an A4 book that I made. If art journaling is your thing, you could use a ready made sketchbook or make your own. Here's one being done in a Moleskine-type journal. Next week we'll look at different ways of making your own art journal. ... don't use a paper version at all. Why not use your computer, phone or tablet? There are Apps available. There's a small charge for this one but there are free ones available. Or you could blog your response every day. And of course there's the option to read this blog and do nothing at all or find your own way of doing it.